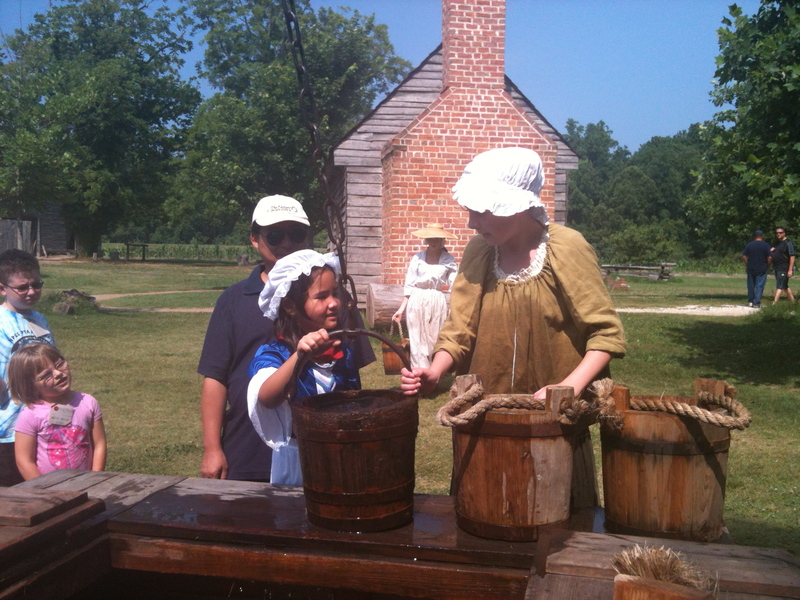 This blog was inspired by a family trip to Colonial Williamsburg in Virginia. I fell in love with everything about this beautifully restored 18th century town — its architecture, its food, and its low-tech tranquility. I was reluctant to come home to New York City. I wanted to throw my cellphone down a well and become a colonial “re-enactor.” But my husband is a city boy, and anyway, did I really want to wear a bonnet and thick knee socks every day? I decided, however, to try re-enacting one element of colonial life in my small Manhattan apartment: the cooking. This will not be truly authentic colonial cooking. I don’t have a brick oven or a garden, just a lot of baking pans and a pile of historic cookbooks. And I don’t promise to cook colonial food every day. My butter- and cream-hating husband would not be happy, nor would my daughter, who would miss spaghetti and pizza. Recipes from the 18th and early 19th centuries are fun to read but hard to follow. The measurements and instructions tend to be vague. “Bake in a quick oven for a good while” is typical. I’ll follow some very old recipes in this blog, but also adaptations from later cookbooks. I’ll also use modern appliances when they’re helpful. Yes, a slower pace of life is nice, but stirring everything by hand is not. I bet those colonial housewives would have wept at the sight of a stand mixer. May 2014 update: After nearly two years of primarily 18th-century cooking, I decided to expand the scope of this blog to include the 19th century and beyond. I wanted to try more recipes by the great cookbook authors of 19th-century America — writers like Lydia Maria Child, Eliza Leslie, and Maria Parloa. I also wanted to cook with ingredients like chocolate (which was only used as a beverage in this country in the 18th century). And vanilla. And baking powder! Speaking of which, the blog’s focus going forward will be baking and desserts. Such a sacrifice on my part, I can’t tell you! –Karen Hammonds is a freelance editor and writer. A former senior editor at WeightWatchers.com, she contributed to a blog at Saveur.com and has edited recipes for Saveur, Bon Appétit, and other publications. Thank you for stopping by and liking my blueberry muffins. You have a great blog here. I will be popping by for some historic recipes. Have a wonderful week! You are very welcome. Your blog is everything I like – food AND history! Hope you accept the award. Hi Karen, I love the concept of your blog and I nominated you for the Liebster award and the WordPress Family award. I’ve often wished I could go back in time and eat the way people ate back then. Your blog gives us a glimpse of that. Thanks very much, Aneela. I’m enjoying your blog, too! Hi, thanks for stopping by and like our pork spareribs recipe. We greatly appreciate it. Love your blog, keep up the delicious pie posts! Thanks, and I like Homemade in Hong Kong as well. I look forward to reading more of your posts! Thanks, Jess. Your blog looks great as well, and I want to try your meat pies soon! Hi Karen, I just needed to write and tell you how much I enjoyed this site. My township will be celebrating it’s 200th birthday next year. I was searching for 19th century foods which may be able to be shared during our celebrations. I can’t wait to try out some of these recipes. Thanks again. Hi Mary, thanks for visiting and glad you enjoyed the site. Good luck with the birthday festivities! Just found your blog, hello from another food historian consultant, and didactor of menus from 6th century Greece to 1940s. I notices you did not a lot of British cookbook for the 18th century. Would be willing to chat further have about 600 books in the collection. Hi Don, thanks for visiting. I’ve intentionally focused on American cookbooks, although obviously many Americans in the 18th and 19th century used British (or British-influenced) cookbooks, like Hannah Glasse’s. I don’t have a very large collection yet — I’m fairly new at this, so much so that I don’t really call myself a food historian. Yet. 😉 I also don’t have room for a lot of books, unfortunately. Online archives come in handy, though. What a fascinating endeavour! I’ve just finished reading a book about the history of food in Germany (the ingeniously entitled ‘Beyond Bratwurst’) and am now hooked on food history! I’m working on a post about macaroni cheese, and your post has been a godsend. Glad the mac and cheese post was helpful. I am really looking forward to reading your blog — there are so many posts that interest me, I don’t know where to begin! Hi Georgina, I’m glad to discover your blog as well. I want to try your rhubarb and ginger biscuits — I wish I lived near the “rhubarb triangle”! Delighted to find your lovely blog!